Rental Registration #: 18-09 Enjoy summer living in this bright, spacious traditional home with a stylish modernist interior. 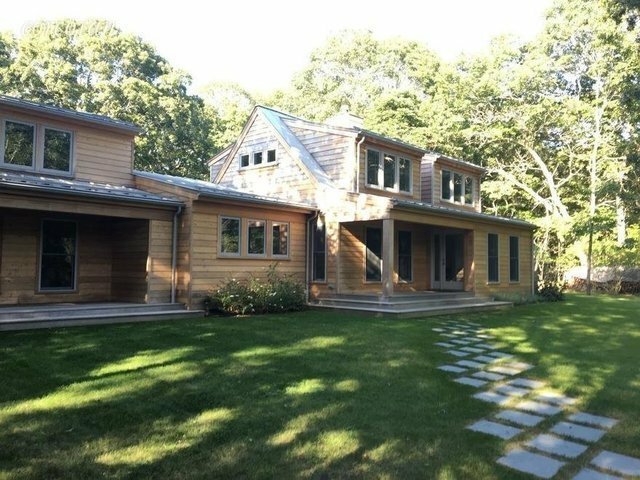 Located in a private setting on a quiet street in the desirable Village Fringe, it is also close to the restaurants, shops and galleries of downtown East Hampton, only five minutes from the charming village of Amagansett and the beautiful ocean beaches. Recently completely renovated, with 3,000+/- sq. ft. of living space on two floors with four bedrooms and four baths, there's room for guests. The open plan first floor has high ceilings, lots of huge windows flooding the rooms with light, and an easy flow of space. Multiple glass doors open onto the expansive deck shaded by a pergola and overlooking the heated in-ground pool. There's a cozy fireplace in the living room for cool evenings, a family/entertainment room with a wide screen TV and the house is wired with built-in speakers and a Sonos music system controlled with your smartphone. The eat-in kitchen with concrete countertops and stainless steel appliances has island seating and there is a separate dining area with a view of the leafy green backyard. Upstairs, the serene master bedroom has a stunning white marble bathroom and beautiful view of the garden. A second bedroom with an en-suite bathroom is also located on the second floor, while a third bedroom is located downstairs with direct access to the pool. The fourth en-suite bedroom occupies a separate upstairs wing. Clean, crisp and up to date, this sophisticated home is the perfect setting for your Hamptons summer..